With the November midterm elections 89 days away, President Donald Trump has yet to sit down for an interview with special counsel Robert Mueller. Trump's legal team has suggested the timing of the midterms could affect the investigation. 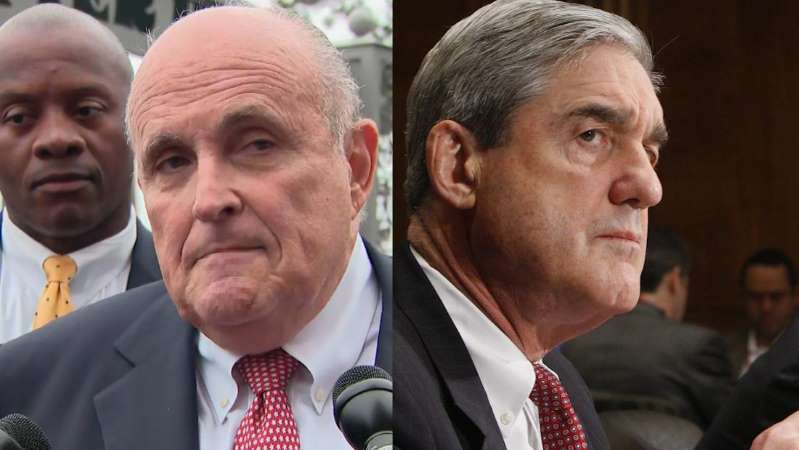 Trump's lawyer Rudy Giulianitold Fox News on Wednesday that if the special counsel's investigation is not completed by September, then there would be a "very, very serious violation of Justice Department rules," because Mueller "shouldn't be conducting one of these investigations in the 60-day period." That's false -- there is no such rule. There are, in fact, long-standing customs at the Justice Department requiring caution around elections, but the breadth is widely misconstrued. [post_ads]Under long-standing Justice Department custom, prosecutors are generally advised to avoid public disclosure of investigative steps involving a candidate for office or related to election matters within 60 days of an election. To that end, attorneys general have issued memos over the years surrounding election "sensitivities," prohibiting the selection of the "timing of investigative steps or criminal charges for the purpose of affecting any election." The last memo on the topic issued by Attorney General Loretta Lynch in 2016 states: "politics must play no role in the decisions of federal investigators or prosecutors regarding any investigations or criminal charges. Law enforcement officers and prosecutors may never select the timing of investigative steps or criminal charges for the purpose of affecting any election, or for the purpose of giving an advantage or disadvantage to any candidate or political party." This policy would apply to the special counsel, as Justice Department regulations stipulate Mueller's team must comply with "the rules, regulations, procedures, practices and policies of the Department of Justice." But is the 60-day custom a firm rule? No. In fact, as the Justice Department's internal watchdog recently noted in a report about the 2016 election: "The 60-Day Rule is not written or described in any Department policy or regulation. Nevertheless, high-ranking Department and FBI officials acknowledged the existence of a general practice that informs Department decisions." Ray Hulser, former section chief of the department's Public Integrity Section who now serves as a deputy assistant attorney general in the Criminal Division, told the Department of Justice Inspector General's Office that while working on one of the Election Year Sensitivities memos, "they considered codifying the substance of the 60-Day Rule, but that they rejected that approach as unworkable." "Hulser told OIG that a prosecutor should look to the needs of the case and significant investigative steps should be taken 'when the case is ready, not earlier or later,' " according to the inspector general's report. "He said that there is not any such specific rule, and there never has been, but that there is a general admonition that politics should play no role in investigative decisions." The controversy over former FBI Director James Comey's public announcements concerning the investigation of Hillary Clinton's handling of classified information before the 2016 presidential election highlighted the stakes involved in such decisions. Even though Trump isn't on the ballot in November, Mueller may still adhere to the general custom of avoiding publicly revealing investigative steps near election time that could wait. But there is no firm rule preventing him from filing charges or taking other action if it cannot wait until after the election. So how does this affect Mueller's work? Contrary to Giuliani's assertion to Fox, Mueller is free to keep investigating beyond Sept. 7 -- 60 days before the midterms -- but is supposed to avoid doing anything overt, according to Justice Department custom. "This long-standing policy is clear on its face," says Jamie Gorelick, who served as the Justice Department's deputy attorney general in the Clinton administration. "Of course it does not require an investigation to be terminated. Indeed, there are many examples of investigations that continued during and through elections." And more to the point -- unlike the now-lapsed statute that created independent counsels, Mueller is being supervised by Deputy Attorney General Rod Rosenstein under different regulations that provide oversight. Under those regulations, Rosenstein "may request that the Special Counsel provide an explanation for any investigative or prosecutorial step" and may reject any action if he concludes it is "inappropriate or unwarranted under established Departmental practices." Bottom line: Mueller's authority is not unbounded -- but the rule Giuliani asserted does not exist.